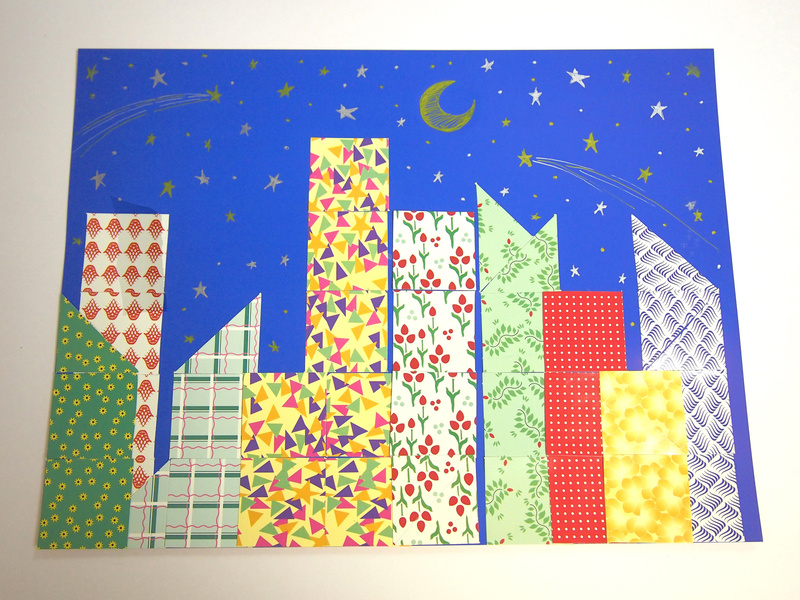 Make colorful patterned buildings against a gorgeous starry sky! Combine color, pattern and shape to create a beautiful artistic scene. 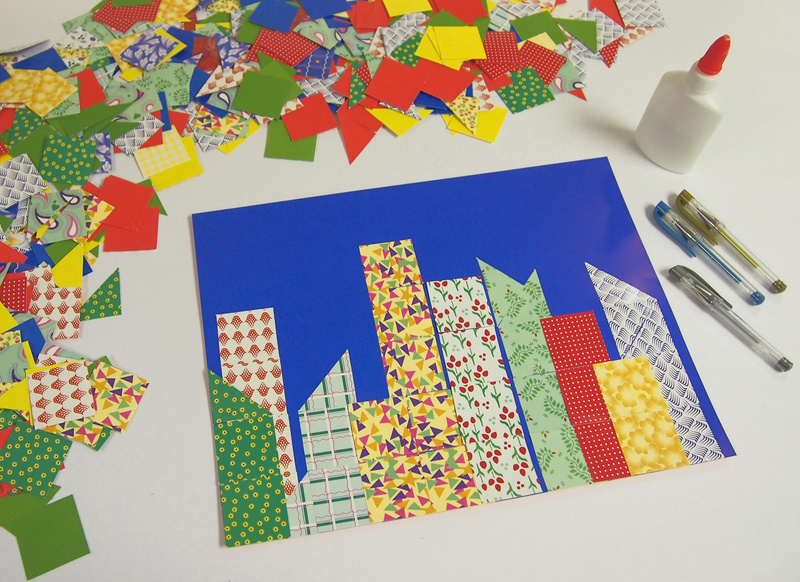 Our R15642 Quilt Mosaics are perfect to make this cityscape! The mosaics add a touch of whimsy to normally stark and severe-looking buildings. Create a fun tribute to quilt and craft shows across the country with this activity! Children will love to decorate the night sky! Use gel pens or glitter glue to illustrate the stars, meteors and moon in the scene. Provide the R15642 Quilt Mosaics in a bowl. 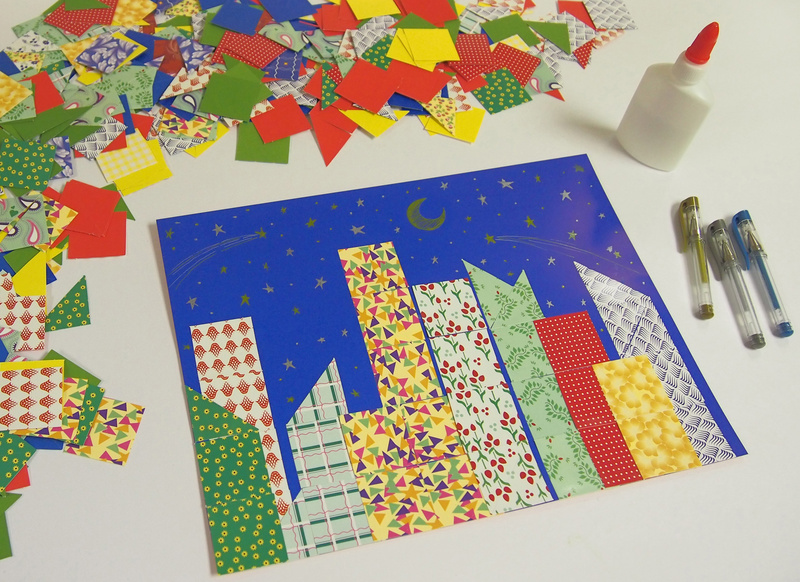 This will help keep children organized as they decorate their night sky scene! 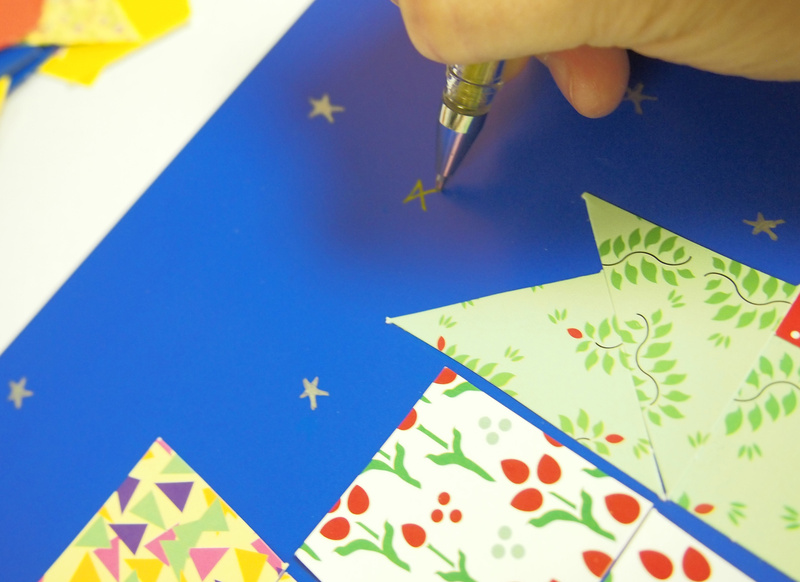 Turn the sheet of paper lengthwise to make a landscape drawing. The R15642 Quilt Mosaics are cut into squares but can be separated to make triangles as well. Select several R15642 Quilt Mosaics and stack them upright on top of each other. When you reach about halfway up the sheet, use triangles to finish off the tops of the buildings. You can leave the tops as squares too. Layer the buildings to create depth and perspective. Lay down the first row of buildings, then choose a new set of R15642 Quilt Mosaics and lay the next row of buildings over top of the first row. You can see that the green building at the front of the page on the left-hand side is not completely covering the building behind it. This creates the illusion that the green building is actually in front of the red and white building. Once you are satisfied with the placement of the buildings, glue them down! Draw little stars around the buildings. 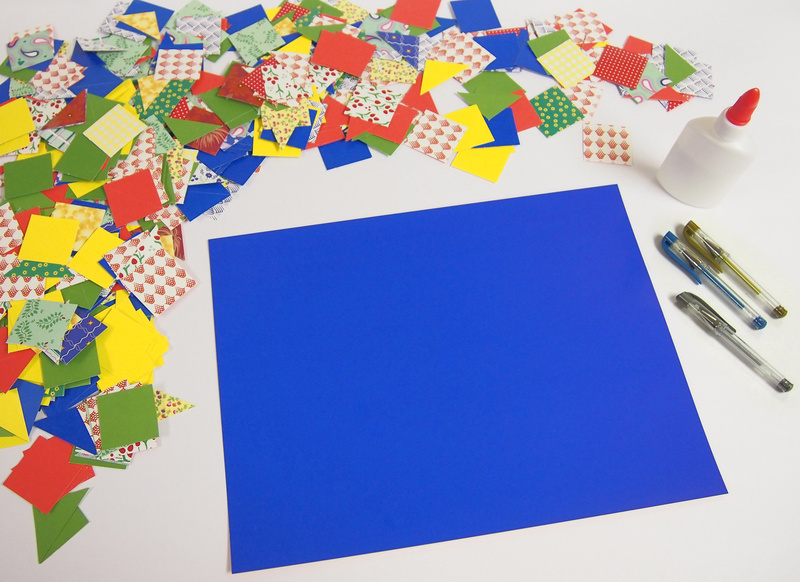 This will help children practice drawing basic shapes! Vary the size of the stars; some will look larger and others will look smaller like specs or dots. Add a crescent moon! Choose one or two of the stars and add wispy trails to turn them into shooting stars! Read a bedtime story to children and teach them about the importance of sleep. Answer questions such as, why is there night and day; why do humans and animals need sleep; and, why do we see stars at night? 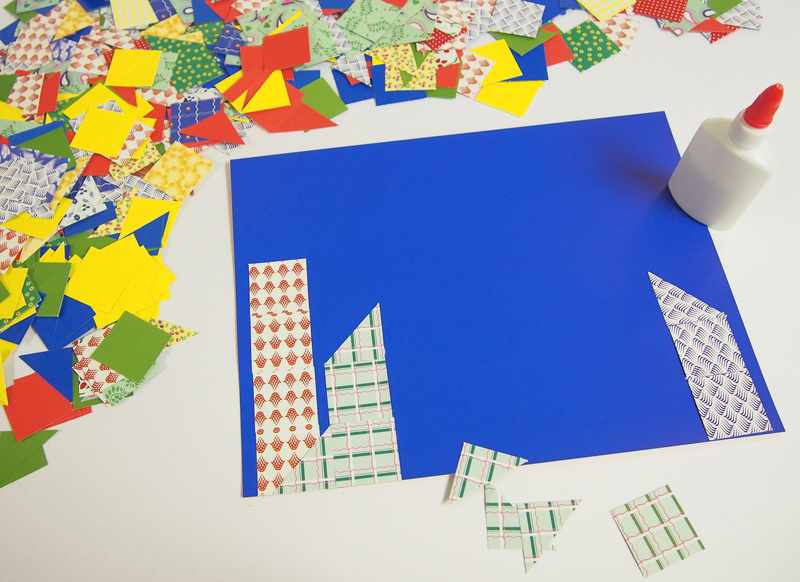 Make a wish on a shooting star and show us how your Quilt Mosaic Buildings turned out! Send your photos and comments to us to get featured in our next post. Contact us through the contact form. We’d love to hear from you! This entry was posted in Art, Crafts and tagged bedtime crafts for kids, buildings art for kids, cityscape art, night sleep bedtime kids, quilt mosaics, starry night sky by roylcoblog. Bookmark the permalink. My children will enjoying making something like this. A wonderful idea. Thank you, Jeanene! Would love to see their work! My grandbabykins who is soon to be 7 already loves my sewing/craft room and doing what we call projects when he visits. I can just see him loving to do something like this. Looks like a fun site. It’s wonderful to meet you, Peabea! I am happy to hear you’ve enjoyed viewing the site just as I’ve enjoyed viewing your post, and hope to see some of your grandson’s work sometime soon! Thanks again and feel free to check back every Friday for new updates!